Note 1: DO NOT BUY FROM SELLER MAOBEN who is selling fradulent units. If you did buy from that chanel, contact Amazon for the assitantce. Make sure it is Sold by florington. Note 2: Don't use a case on that is thicker than 0.31 inch (8mm); OtterBox, LifeProof, Zizo, Spigen, rugged, metal, credit card, and PopSockets cases are not compatible. Q: Why does it not charge my phone or charge intermittently? A: See the notes above. Q: Why does it charge slowly? A: Make sure that you use a Quick Charge 3.0 Adapter, and it is highly recommended to use the one that comes in the box. Q: Can I charge my phone while using GPS? A: Yes, but it is highly recommended to use our Quick Charge 3.0 Adapter that comes with the box. The best solution for heavy phone users in cars, such as Taxi, Uber, and Lyft driver. Q: How large is it? A: It is delicate, a perfect gift for men or women. 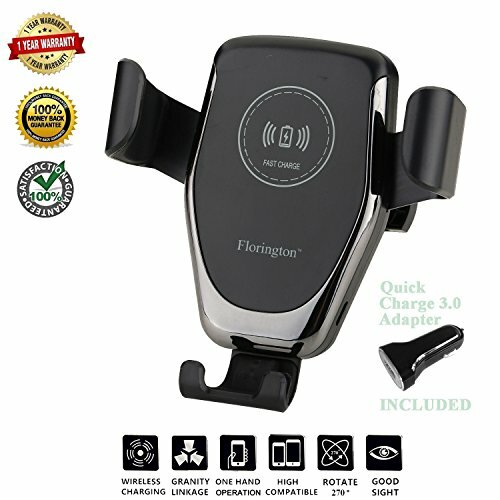 Florington Fast Qi Wireless Car Charger, Air Vent Holder, Windshield/Dashboard Sticky Mount Stand, USB Power Cable, and Quick Charge 3.0 Adapter, and User Manual. COMPATIBLE DEVICES: Apple iPhone X, iPhone 8, 8 Plus, Samsung Galaxy S9, S9+, S8, S8+, S7, S6, LG V30, V35, G6, G7 ThinQ, Nexus 5, 6, and other Qi-enabled devices (Note: Phones without Qi-function will need to buy additional wireless receivers). FAST AND AI SMART: Florington Fast Qi Wireless Car Charger provides you up to 50% faster charging speed than the standard chargers. The built-in integrated circuit chip intelligently detects the current remaining battery charge and enhances phone life with overcharging, voltage, and temperature protection (Note: 7.5W for Apple devices; 10W for other devices). TWO WAYS OF INSTALLATION: Choose between air vent installation or bracket base. With the new 2-in-1 mount stand and the automatic gravity design, now you can use it for the windshield, dashboard, or air vent. Simply put your phone into the holder and the three support arms will automatically grip your phone. It is easy to use for men, women, Taxi, Uber, and Lyft driver. SATISFACTION GUARANTEE: Our wireless charger is backed by our manufacturer 30-day money back guarantee with the 1-year free replacement warranty. If the device fails due to a manufacturing defect, please contact us directly to initiate return and warranty process. ACCESSORIES: Florington Fast Qi Wireless Car Charger, Air Vent Holder, Windshield/Dashboard Sticky Mount Stand, USB Type C Power Cable, and Quick Charge 3.0 Adapter, User Manual, and Responsive Customer Care Team. If you have any questions about this product by Florington, contact us by completing and submitting the form below. If you are looking for a specif part number, please include it with your message.